Amazon Brand Analytics is a data tool provided by Amazon. It gives inside analytics on keywords in an understandable format. Brand Analytics started in Amazon USA and has now been rolled out to the UK and European Amazon Seller Accounts. Before Amazon Brand Analytics was on a Mystery URL – now it’s available in Amazon Seller Central, the dashboard for Amazon sellers. You can find it on Seller Central under the “Reports” dropdown menu. Danny McMillan is an Amazon Seller, the host of Seller Sessions Podcast, and a public speaker at Amazon conferences and events. Danny is also soon to be host of a major UK Amazon Conference on June 1st this year in London, England. Danny is the guest in today’s podcast and the source of most of the majority of information on this detail (I’ve added some details and a little extra research – Michael Veazey). For other interviews we have done with Danny McMillan, click here. What info do we get in Brand Analytics? We get word Search ranking from Amazon themselves. We can see click share and conversion share (which we’ll discuss shortly). You can set different date ranges as well. Amazon has recently boosted its revenue from advertising by a massive percentage. Therefore it’s not in Amazon’s interest to make the return on ad spend too clear; it very much wants us as sellers to spend our money on advertising. Amazon sharing data with us doesn’t make so much sense in that context. So in this context, why has Amazon launched Brand Analytics and apparently shared so much more data with sellers? Firstly, brand analytics is trying to avoid Anti Trust legislation in the USA, which is basically is basically designed to prevent monopolies from emerging. Sharing more data in brand analytics is part of them trying to show open behaviour to the US authorities. Secondly, Amazon has been trying to placate the Indian authorities, who were resisting Amazon selling there as Amazon competes as a seller on its own market place. Amazon as a seller can obviously take advantage of insider data from Amazon as the marketplace provider. Brand analytics is part of apparently redressing this imbalance. The third reason for introducing Brand analytics is that Amazon now has AMG – Amazon Marketing Group. This is aiming to attract big High Street brands in the USA to come to Amazon. Ultimately Amazon wants these big sellers to shift some of the advertising revenue from traditional ad agencies in Madison Avenue, who run things like TV ads, to Amazon’s advertising platforms. These are companies that will spend $30-50K in advertising per product line at the “top of the funnel”, so including Google, TV, Facebook and Amazon ads. These brands are used to Google and Facebook, which are the other huge online advertising platforms. Both of these companies give precise and generous data about many things to advertisers. If you compare google ads and Facebook data, Amazon is taking baby steps in that direction with Brand Analytics. Brand Registry 2.0 is required (this is also true for Enhanced Brand Content, an additional set of enhancements, primarily extra images and text, that Amazon offers on product listings). This primarily means getting your trademark registered. The good news is that getting a UK or EU trademark is way faster than in the USA. In addition, in most cases, this trademark should also enable an Amazon seller to get brand registry in Amazon USA. The reason for doing this is that in the USA, it can take up to 8 months to get a Trademark. However, you need to confirm with Amazon Seller Support first. This is important because – as in so many things – Amazon is not always consistent in their response. Michael spoke to two members of the 10K Collective mastermind recently at one of the mastermind meetings. Both sellers have UK Companies and both registered a brand trademark in the UK and then applied for Brand Registry in Amazon USA. One got accepted for Brand Registry; the other was rejected. The key is to have a name that is unlikely to be controversial. For example, if you are going to sell goods in a market niche or category like sports and outdoors, calling your company/brand “Sports and outdoors Inc” is likely to cause it be rejected. That’s because it’s obviously a generic term (ie not company or brand specific) that could be used by anyone to refer to this niche. The moral of the story is: Don’t make up a name after the name of a vertical (or a niche market). Richard Koch (Star Principle) also advises against naming a brand after the vertical/market/niche you are trying to dominate – it’s going to confuse your consumers if you do this. The classic bad example is the “Palm Pilot” company in the late 1990s. They pioneered a computer you could hold in your palm. Thus the natural generic name (name for the new market niche or vertical) was a palm computer. But their brand name was also “Palm”. So when consumers spoke of “palm computers”, it was hard to know whether they meant the brand itself or just a similar type of device. A better example of how to do it is the iPhone. iPhone is a classic super strong brand. It also created a new category of product (or vertical) which came to be called “smart phones”, in which category it was the dominant force for about a decade. But there was a clear difference in terminology when consumers discussed smart phones as opposed to the dominant brand, iPhone. You can get a trademark within about 8 weeks in the UK across 2 classes. It will take just 20 minutes to submit it yourself, which is what Danny advises. You can submit what’s called an “image mark” – usually a logo of some kind – and a “word mark”, which is exactly what it sounds like, basically your brand name. Of course you can use a lawyer, but you can always do that if you don’t have success doing it yourself. This is the approach Danny favours. The traditional reason for trademarking is to get legal Protection. For Danny, this is secondary to the need to get access to Amazon’s better tools through Brand registry. There are about 40 of them (actually 45 at last count –ed. ), and you can choose which ones you want to go for. Here’s the UK Government’s guide to trademark classifications. Just choose 1 or 2 classes that seem most relevant to your products. Remember that it doesn’t matter if John Smith is a trademark in the class of “Beer and brewery products” (in class 32) if you are wanting to trademark “John Smith” in for example athletic clothing (Class 25). You can also set report frequency – daily, weekly, monthly, quarterly. It’s NOT telling you number of searches, ie search volume; it’s just the search rank. Amazon does not officially give away search volume in Brand Analytics (or anywhere else, indeed). However, there are a lot of tools out there. It’s worth noting that none of the search tools now use live Amazon data. There was a hack in AMS for them to grab search term data for about a year. On Dec 19 2018, Amazon closed down that loophole. They have a 12 month period of actual data to work with, so they are probably not too far off the mark. They are all flawed in terms of revenue and sales velocity (units sold per day or per month) but basically all in the same position. There are 250,000 rows of data in Brand Analytics. But there is a search box, which helps you work through the data. What data do you get in Brand Analytics? Search terms are based on Frequency in order of searches on Amazon in Brand Analytics. Click-share in Brand Analytics is the just percentage of the total clicks that the ASIN received as compared to all other ASINs in organic search results. That is not the same as the CTR (Click Through Rate) we are used to seeing in Amazon Sponsored Ads campaigns. In most search engines, the top 3 take the bulk of the clicks. You could then use a tool (such as Helium10 – note, this is an affiliate link) and look at the number of units sold, although it’s worth noting that these are predictions based on an algorithm. Conversion share in Brand Analytics does not represent the conversions (sales) for a given search term. It’s the % of total sales that each of those ASINs received for that keyword. How do we use this Brand Analytics info? This does not replace any of the search tools! It’s best used for Discovery of potential new product ideas. You can download the Brand Analytics data as a CSV (spreadsheet) file. Danny advises not to for top frequency searches (which usually have a huge volume of searches – but also massive competition). Instead, look for medium frequency keywords, say from 4000th rank. If you have Brand Analytics, you can work through this example flow to train yourself. Sales by listing – £1071, £527; £113, £287 etc. How you use Brand Analytics data depends on what your business model. Let’s say your model is to manufacture in the UK – as Danny does on several product lines – and to “fly below the radar”. That is, you aim to sell just a few units per day but across multiple product lines, which means you’re not risking black hatters chasing you. As long as you have quick turnaround in the product sourcing and reasonable MOQ (minimum order quantity) this can work well. This can be used to look at the previous periods (within reason) such as Q4; and is also handy for seasonal checks on products. What you don’t want to do, for example, is to buy halloween cups only to find that people want to halloween costumes. Brand Analytics gives you more data to help you make that choice. Danny wanted to give Amazon sellers the same selection people get in the USA. So he is Bringing in 6 international speakers from the USA and South Africa. In the keynote theatre – tiered arena – have a workspace in front of you. There is no sponsorship this year. Danny walked away from lead sponsor and left £5000 on the table. The reason was that the sponsor wanted to charge an Interest rate that was 60%! Danny couldn’t do that with a good conscience to fellow sellers. Danny wanted to get away form the “ Ponzi scheme” type event with feel good atmosphere where sellers get overcharged at the end for an event when they are hyped up. The location is in London in Aldgate- near Liverpool Street in the City of London, which means it’s nice and quiet on the weekend. So tickets now cost £319. Today on the show, I have one of the first contacts I made when starting this show, David Aggiss. I had him on, all the way back in November of 2015. Since then, he has given up the day job and is his own full-time boss. He has a few business, one of which being an Amazon business. 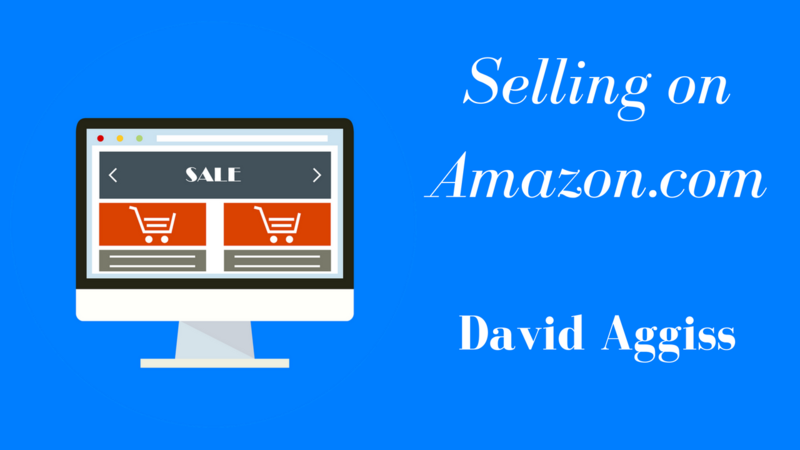 We’re going to dive in and find out David’s strategy for selling on Amazon.com. David started learning about Amazon in April/May of 2015 and began receiving some training. In about four months, he started selling his own product. He took off quite well in Q4. At the time, incentivised reviews were still allowed so he made that a large part of his strategy. His sales exceeded his expectations going from 10 units a day to 30 on average. He launched his second product in Q4 last year and focused on his listing since incentivised reviews were no longer available. There are a lot of techniques for finding products. David decided to simply look through Amazon. This is a great technique for finding good products. Look for lower prices and low competition items when first starting out. If you find a good product and the listing isn’t optimised, then there is definitely an opportunity for you to sweep in and take over. You can use Google Trends, Merchant Words to help you find what popular and what people are looking for. David didn’t use any tools to find products, like Jungle Scout etc. He didn’t know what his products would be so he wouldn’t know what to search. Once he picked the products, he verified through Jungle Scout that there was a demand. Now he has about 5 products he’s working through launching. He search Amazon to find his products. He narrowed his search to products between $15 and $50 and looked for products that interested him. If you are interested in the product then it’s easier to relate and figure out what those buyers are looking for. Then you can tailor your listing to those shoppers. Getting reviews has become much more difficult since Amazon banned incentivised reviews. With this new world, you have to pay more attention to reviews since you can no longer give products away in exchange for a review. One thing to pay attention to when getting started with a new product is the number a reviews your competition has. If they have thousands of reviews, it’s going to be much harder to compete because it is more difficult to reach a competitive level. Make sure you competitors only have a hundred or so reviews so you can better compete. Then you can use other services to help get legitimate reviews. You can also try to get traffic coming in from off Amazon.Ads on Facebook, Google, and Bing are great places to start. There are also ways you can use Amazon to boost your listing. Spending heavy on PPC at the beginning is a good way to drive traffic when selling on Amazon.com. Once your listing gets going, then you can cut back to where it’s profitable. One thing David mentioned was participating in Lightning Deals. These deals on put on by Amazon that offers their shoppers very good discounts for a very limited amount of time. There is a link underneath your Advertising tab on the main screen of Seller Central. It’s not all the time, but Amazon will offer you a Lightning Deal when it’s relevant. This is a great way to drive a lot of sellers to you listing and gives a nice boost to new products. Amazon sets the parameters. They will tell you the time slot, the minimum number of units, and the sale price which is based on your sales history. David, for example, recently got a time slot for 1am to 7am. Not the best time as many people aren’t looking at Amazon so early in the morning. Despite that, he had an additional 40 sales from the deal. I wasn’t planning on recording any podcast for a few days but I just had an experience as an Amazon buyer that is very important for Amazon sellers to understand. Psychology is very fascinating to me and it should be to you as well. There are different parts to the Amazon supply chain and psychology plays a major role in many of these. The aspects that I am most fluent in are negotiations and selling/marketing. What makes consumers buy and what makes consumers attracted to your projects? Recently we talked about message to market match and that if someone is looking to buy a red dog bowl and you are specifically selling a red dog bowl then they are much more likely to buy your product. This is a very powerful concept. This can be the basis for an incredible business. The other thing we talked about was Know, Like, and Trust. The other day, I was going to print some music from my Brother printer and I was getting an error telling me to change my toner. I didn’t want to deal with this but I knew I had to take care of it and not be lazy. Notice, I’m reacting to a problem. I’m not thinking this through like a business transaction. It’s a consumer purchase, I’m not a print shop, I’m just a musician that occasionally prints some stuff. I didn’t plan it, I didn’t know about it and I didn’t want to do it but it’s a necessity. I was motivated by urgency. That’s often the case with consumers on Amazon with all types a products. From things as mundane as a printer cartridge or as urgent as forgetting to get a birthday gift for your spouse. If I had more time I would go down to the shop and buy the cartridge or item I needed. However, I just so busy, I need to buy it quickly on Amazon and get on with my day. In my urgency and need to be done with this quickly, I almost missed the mental processes that took place. So, I get on Amazon, search for the printer cartridge I need and scroll through the listings. I got to about the fourth one down and immediately decided that’s the one I want, almost missing what was going on in my head. The first listing was £9 and it looked like a compatible item, but I scrolled past it until the fourth or fifth which really caught my attention. It was such an intuitive process that I had to slow it down and ask myself, “why am I about to but this?” First off, I’m not in a price comparing mood. It was way cheaper than I was expecting. I was expecting £40 or £50 for an actual Brother cartridge and the listings were in the £9 to £15 range. My price resistance was way down because I was prepared to pay almost 5 times that amount and move on. Since it was so much cheaper, I wasn’t going to sit there and compare prices. What set the listings apart, and what won it for me, was the one offered a two-pack. If I were to reverse engineer my buying thought process, the first thing that got me was that it was a two-pack and bundling brings out the value thinking. The price compared to the top listing. I could see that it was a value to get the two-pack over the one pack. The my frustration of running out. Since I didn’t want to be in this situation, I would want to buy the two-pack so I wouldn’t have to go through this. This is true for a lot of stuff. If you are selling anything renewable, bundling them brings value to the buyer because they don’t want to run out in a month or two. The next thing thing that won me over was that it specifically said it was for a Brother printer. The listing said exactly what I wanting to see rather than almost what I wanted to see. That helped push me over the edge and buy it. Even as an Amazon seller, I was almost taken unaware with the way selling works. If I didn’t spend my life working on Amazon and teaching others how to sell on Amazon, I would have completely missed how the psychology of this process works. It came down to three things. The last thing I noticed that influenced my decision want the ratings. The top listing had 39 reviews and 4.5 stars. It was that little bit of imperfection. Whereas the one I bought had 16 reviews and a 5 star average. If I were being objective, I would calculate it. The one listing had many more reviews and likely had just as good overall satisfaction. Some buyers will do this, so it is a very important aspect to be aware of. However, in these urgent situations, consumers tend to be irrational and see 4.5 stars compared to 5.